In just four days, Royal Australian Air Force Base Williamtown will receive Australia’s first two F-35A Joint Strike Fighters (JSF) and the atmosphere is electric ahead of their arrival. Williamtown will eventually be home to 56 JSFs, and the RAAF has been working feverishly ahead of the arrival of the first pair. The F-35A Operational Precinct has been developed specifically to house Australia's new jets, and at the current time is "more than capable" of receiving the first two JSFs. Part of that project involved the extension of the runway from 8,000 feet to 10,000 feet, which not only allows extra safety for the pilots but will help reduce noise due to the jets using their afterburners less. There will also be a combined 3 and 77 Squadron Headquarters, which will help "exercise effective command and control of F-35A operations and to prepare for exercises and deployments". Security for the base has also received a huge facelift, worth nearly a billion dollars. Greater security measures have been introduced, including upgrades to the perimeter of the base as well as individual facilities. At one point there were over 900 contractors working on-site, although that number dropped after the main exterior buildings were completed. As it stands, the facilities are still yet to be fully completed, but are capable of holding the aircraft due to be delivered by the end of 2019. Group Captain Peter Cluff, Base Commander at Williamtown, estimated that by the end of 2019, the upgrades at the base would be completed entirely. It's not just infrastructure advancements that have the RAAF working around the clock, but also preparing for launch day on 10 December. Thankfully, finding Air Force staff to help with preparations for launch day has never been easier, according to GPCAPT Cluff. "The whole base is buzzing. I have more volunteers to be involved in this launch than I can poke a stick at," GPCAPT Cluff said. "Even for the marshalling of traffic." The RAAF is not alone, with significant interest growing in the project, which is the most expensive in RAAF history at $18 billion dollars. GPCAPT Cluff spoke about his personal excitement at the arrival of the F-35As. "I think it's brilliant. It's great to see new capability coming, this is going to be such a different type of aircraft than what we've got," he explained. "It's got stealth capabilities, different composites and with that brings great technology for Australia and for the region. The maintenance personnel will be dealing with high-end equipment and that brings with it skills for defence and industry." According to GPCAPT Cluff, the local defence industry is just as excited as the RAAF at the JSF arrivals. And so it should, with the F-35A arrivals marking the beginning of a new multibillion-dollar industry, be it working on sustaining the jets, or supporting the IT capabilities of the most technologically advanced jet the RAAF has ever owned. 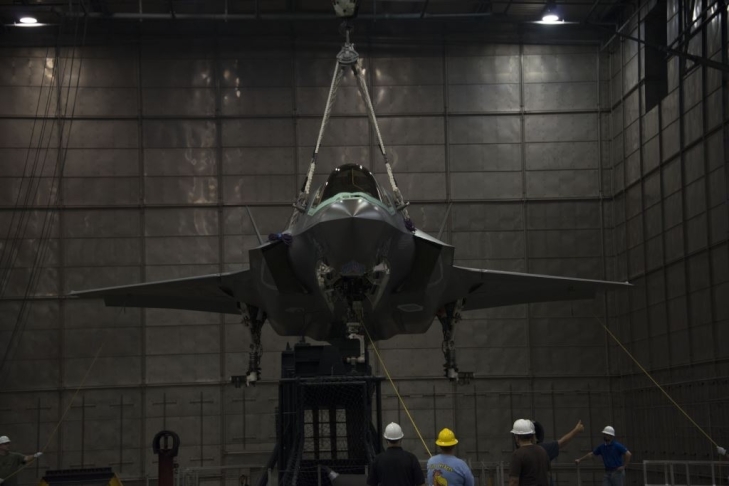 In the Hunter region, the F-35 program is forecasted to create up to 400 engineering and skilled technical jobs over the next five to seven years. And nationally, 15 companies at 18 different locations have been contributing to the F-35 program, supporting over 2,000 Australian jobs. The JSFs are scheduled to arrive at Williamtown after 10:10am AEDT on Monday, 10 December, with members of the public along the Hunter Coast to be treated to a formation flypast before they arrive at the base. From 9:50am, the public at Port Stephens will be able to see two F-35A Joint Strike Fighters and up to three F/A-18A/B Classic Hornet aircraft flypast, and this is partly to ease congestion around RAAF Base Williamtown on launch day. Residents are advised to head to any vantage point or exposed location along the route to view the formation of up to five aircraft at least 30 minutes before the scheduled times. The scheduled route can be found here.